Hello lovelies, I hope you’re all enjoying a calm and craft-filled weekend! In my most recent episode I showed off a HO (Half-finished Object), the progress I’ve made on my Threipmuir sweater, and chat about a couple of recent design submission calls I’m excited to spend a bit of time working on. As I’m working on the same projects that I spoke about in my first episode, rather than repeating myself in this post, simply click here to visit my show notes for episode one if you want more details about the yarns/ colours/ needles sizes etc. that I used. The first sock absolutely flew by but I made the mistake of not casting on the second one IMMEDIATELY. Fingers crossed now that I’ve finished the tedious 2×2 ribbing and am into the stripe sequence again I’ll get back into the flow and have them finished and posted off to the recipient in no time! This project is living in one of my many Baggu bags, I definitely recommend that you check out the brand if you like good quality, functional, jazzy bags. If anyone knows of any UK stockists, I’d love to hear from you! I can’t put this down! This is a gorgeous pattern, and I’m completely addicted to ‘just knitting one more round’. I’m already excited to cosy up in this sweater once the days turn cold again. 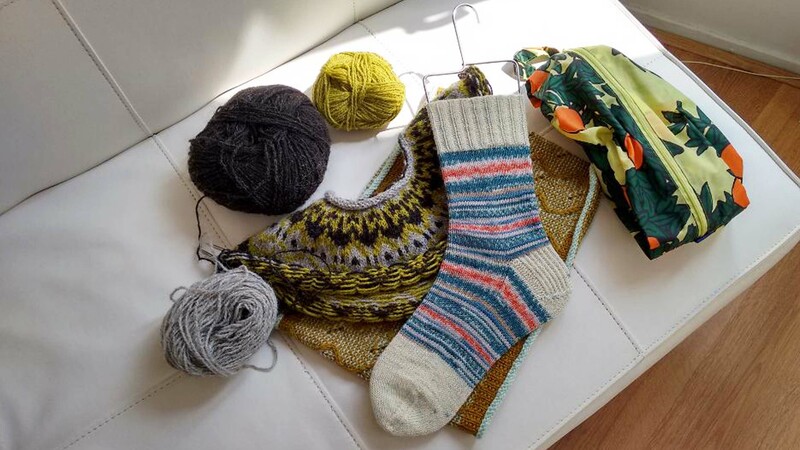 The yarn is from the Birlinn Yarn Company and is knitting up like a dream. I’m hoping I’ll have enough left over once the sweater is complete to knit a pair of mittens or a hat. I stumbled across two calls for submissions posts on Instagram this past week. The first was from Brooklyn Tweed for their publication Wool People 13 which I believe is due out next summer. The theme is Japan and their mood boards are full of tasteful images which explore texture, colour and intriguing silhouettes. You can find the full call here. The second design submission call is for Mild Woman, a brand I first heard about whilst listening to Ani of the Close Knit podcast interview the two friends behind it, Jess Shreibstein and Clair Moskal. The inspiration behinf their AW18 collection is female artists and I can’t wait to develop a little concept which explores this theme! You can find more information about their call here. I took several videos on my phone in the hope that I could slot them into the end of the video but, as I mentioned in the podcast, my phone is several years old and I didn’t feel the quality was good enough. Instead I’ll leave you with this picture I took of the station just as the sun was setting. It’s a truly incredible building and the city is definitely one I would like to go back to some day! So I hope that covers everything from this week’s episode of Wool Is My Bread. If you have any questions please feel free to leave a comment, I would love to hear from you!